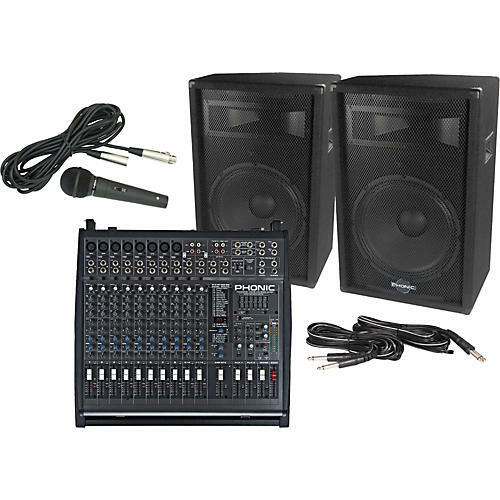 This package includes the following PA equipment: Phonic Powerpod 1860 powered mixer with 400W stereo power, 8 mic/line mono channels, 2 stereo channels, and 16 onboard 32/40-bit DFX; 2 S715 15" 2-way speakers; and a microphone with cables. The Powerpod 1860 Plus Powered Mixer is a 10-channel (8 mono mic/line, 2 stereo) live sound board with 400W per channel at 4 ohms. Channels 1-8 feature mic/line inputs, phantom power, and -18dB low-cut filters. All channels have muting, channel solo and PFL with metering, inserts, aux level, effect level and pan. Onboard DSP provides 16 32/40-bit effects with parameter control. An assignable 7-band graphic EQ provides additional control. Master section controls include faders for effects, Aux 1 and 2, mono monitor level, and summed mains L/R. Comprehensive I/O includes RCA inputs, record outputs, aux and FX sends and returns, control room, and unbalanced main L/R and mono outputs. Comes with microphone, mic cables, and speaker cables. The Phonic S715 15" 2-way Stage Speakers have 400W program, and 600W peak power handling. They incorporate 15" heavy-duty woofers, with piezo tweeters. These PA speakers have a built-in handle, and a 35mm stand adapter built-in as well. They also have dual 1/4" phone jacks, and can be used as floor monitors or mounted main speakers.